Initially focused on catering to students situated in the district of Puchong, she has now expanded her business to Kota Damansara with the opening of Prana Studio in July 2007. Tracy shared that she first started her career as an aerobics and fitness instructor. In the course of her work, she would frequently experience muscle aches and joint stiffness due to the rigorous nature of her job. When she started attending her friend’s yoga classes, she found that she developed greater flexibility and noticed a huge improvement in her physical condition. During that time, she was also suffering from serious gastric problems and headache – two symptoms which according to Tracy were usually inter-linked. Today she is happy to reveal that she no longer suffers from any of these problems. She adds that she has less emotional problems after picking up yoga. After experiencing the health benefits of yoga, it naturally became her dream to spread the awareness of yoga so that others could also enrich their lives through its practice. It was thus that she started conducting yoga lessons for fitness centres and later, established her own studio, PerfectLine Yoga and Fitness City, in Puchong. To date, Tracy has been practising yoga for more than 8 years. When asked what sets her yoga centre apart from the rest, Tracy accredits Pradeep, the master teacher whom she met in 2006, as the source of keeping their yoga classes updated, authentic and holistic. According to Pradeep, one should not always only concentrate on textbook yoga; that is, simply performing yoga postures or Asanas while ignoring the mental and spiritual development that comes along with yoga. And being a veteran in the art of yoga, Pradeep certainly knows what he is talking about. He was born and is still currently residing in Bangalore, India, where he started learning yoga from his father since he was 7 years old. To Pradeep, yoga was simply a part of his everyday life, an exercise he would practise in his spare time for health purposes. The engineering graduate only decided to embark on a career in yoga after facing stagnation and lack of creativity in the course of his full-time job at that time. He took a 2 years break from work and pursued a master’s course in Yogic Sciences at the Bihar Yoga Bharathi University in India; graduating with a gold medal. Since then, Pradeep has co-founded Atmayaan, a centre that offers instructor training courses, where he is also head of training; and has been teaching yoga internationally in countries such as Bangalore, Bangkok, Kuala Lumpur and Colombo. According to Pradeep, it is highly important for yoga instructors to adopt a continuous learning mentality and consistently attend instructor’s courses to refresh their knowledge on the teachings of yoga. Budding instructors would be keen to know that the master teacher often makes trips to Kuala Lumpur to hold training courses and will begin the International Yoga Instructor Course at Perfect Yoga on the 21st of March 2009. The team behind Perfect Yoga seems set to be in the yoga industry for years to come. Hoo says he will never stop practicing yoga as it is one of his great passions in life. The partner and director of Perfect Yoga shared that it was “love at first try” when he knew what he wanted to do with his life after his first trial lesson. Three years on, he has co-founded the Prana Yoga studio in Kota Damansara where he teaches yoga full-time. The team is hoping to establish Perfect Yoga not only as a leading yoga centre in the region, but as a yoga academy; a venue to impart authentic advanced yoga knowledge to aspiring yoga instructors or simply to spread awareness of the benefits of yoga to anybody who might be interested. 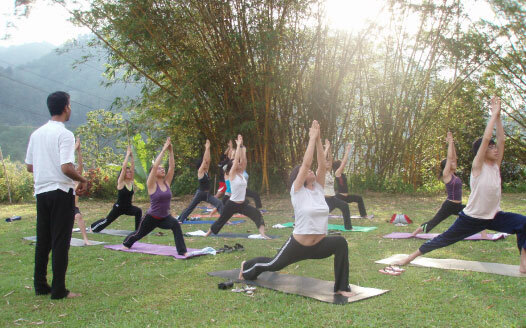 yoga is a good activity for women. i saw lots of them at the gym. just don’t overdo it! The previous YZ studio… Class started? Do they have a website? Hi Mang0, yep that’s de one, its on the third floor. Tel: 03-8060 2197 and 017-212 8718. Would I known the price of the course ? I am actually looking for a yoga centre in Puchong, Bandar Puteri to be exact. Practised yoga about 1.5 year ago but it only lasted for 4 months due to work schedule. Would like to pick up yoga again. I think a beginner class will suit me well. Can you please advise the cost & schedule of your classes? Prefer night class or weekend classes. Im just after giving birth 6months and I have put on weight. It was a ceaser and I couldnt go for any massage at that time. Can Yoga help me to reduce weight?Please reply. Please send me the time schedule and the price for yoga? Hi I would like t find out more about Perfect Yoga. I’m living in Kota Damansara and am looking for weekday night classes. What would be the fee structure like? You may also reach me at 012-2363 910. Thanks. Hi I’m interested to join Perfect Yoga. I would like to know the joining and monthly fees? Beginner yoga class.Working adult.What would be the schedule and the monthly fee like? I have a serious weight problem, is it possible to lose weight thru Yoga, as I’m afraid to go to gym as it might build more muscles. Can i fix an appointment, thanks.